After running workshops with Falmouth Fashion BA students (with a view to them creating portfolio designs for their collections at the end of the year) they have produced amazing work and have won a British Fashion Council award for Portfolio design! Am very proud. This is the illustrative conflict. To not destroy the small intimacies of a poet's text – to not brutally highlight or explain something which is poetic, ambiguous and beautiful. What is evident from a first reading of Oedipa is that the words don’t want to be on the page – they want to be in your mouth. My practice is somewhere between illustration and design – with a background in theatre, which I draw heavily from. I treat each collaboration as an opportunity to stage a writer’s work, the book, the paper, is a theatre. McCauley’s preface calls her text a ‘machine which uses the page as its performance space.’ So there was an obvious affinity. McCauley sites Martha Graham as an influence and when I’m working I like to have a soundtrack, which connects me to the writer. ‘Perfect’ – I thought – I’ll listen to scores for Martha Graham’s choreography. But you don’t just listen to a dance piece. I’d look them up on you tube and then get hooked on the movement. Fairly immediately I was struck by a bit of costume design in Night Journey. The dancers have strong white lines running along the bottom of their skirts, these highlight the way they move – changing as they kick and twirl. I wondered how to highlight the kicks and twirls of Oedipa. What costume could I dress it in? The piece, as concrete poetry is already choreographed - it is already has movement - So I felt like ‘dressing’ the choreography already in place was a good approach. With bold lines, matching the skirts of the dancers - I decided to trace the shape of the words. It felt like notating the work as if it were a dance. And if felt like a way to not disrupt the ‘small intimacies’ within the text, but to compliment them. Somehow the lines felt brutal – simplistic and somehow they felt like they were holding and supporting the words. They would move and bend with each turn of the page. To highlighting the mechanics of the book object. I chose (though it was difficult to source) translucent paper so that you could see these marks - layering - like the circuit board of a strange machine. I also made my grid visible. I matched the time span given to the piece, (17 hours of daylight) with 17 equally spaced vertical lines, & pulled horizontal lines from these in classic ratios. Which I give numerically, as the preface announces the poem as a machine, on the opposite page. This normally invisible structure is given from the outset – like the key to understand the shape of the piece. I’ve started working in earnest on my next design project – it’s a collaboration with a writer who I adore. I approached them with the idea a while ago, since then it’s been bubbling away: stolen meetings, coffees, red-velvet cakes [all refreshments were both necessary paid for]. I’ve been putting it together in the background of other projects, slowly working with the text to find the shape I think works best for it. The script has been pieced together from audio recordings – while late night making in the studio – I’ve been listening and contemplating, while cutting yellow corners. I’ve got instincts for how it will look – but for now it is in that glorious stage of possibility, of flux – and undoubtedly needs, some more stolen meetings, coffee and cake before it can be put to bed. I’ve been making archive boxes and an oversized book (A1) for artist A.Goodwin. 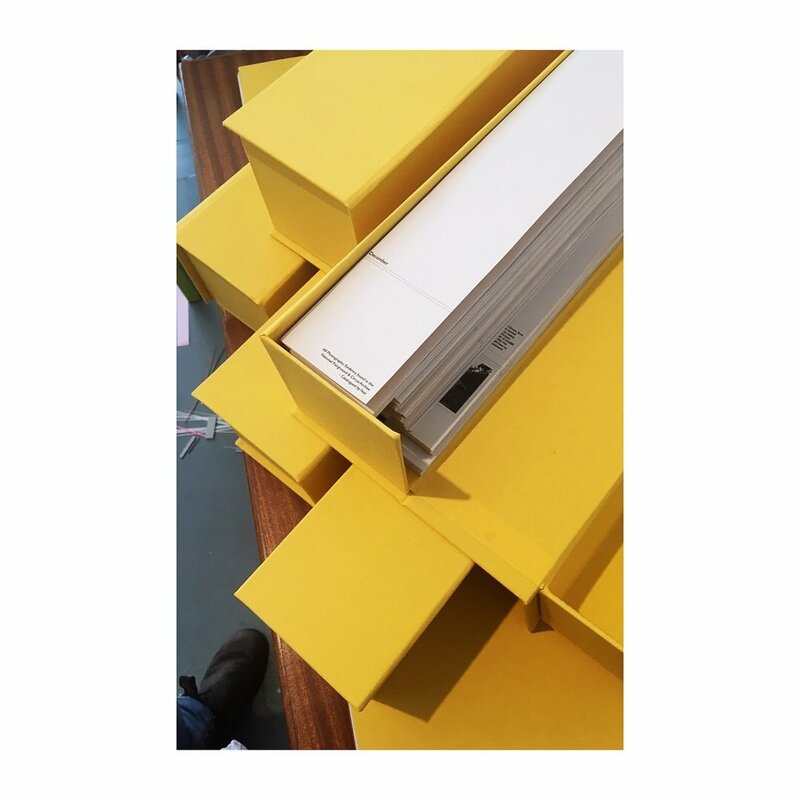 She needed five (Five being a very important number for her project) long archival clamshell boxes for the original art works (we had previously exhibited in my space) and one book to contain her research. Working on a large scale meant completely changing my workspace, I needed bigger everything, and there never quite seemed to be enough surface area. Thankfully, although slightly longer arms would have been a bonus, the principles were all very much the same. As with everything I do, I put so much love into them, I didn’t want to let them go! I didn't even help the artist carry them to the car. But, truth be told I always think it’s a good thing I want to keep the work. 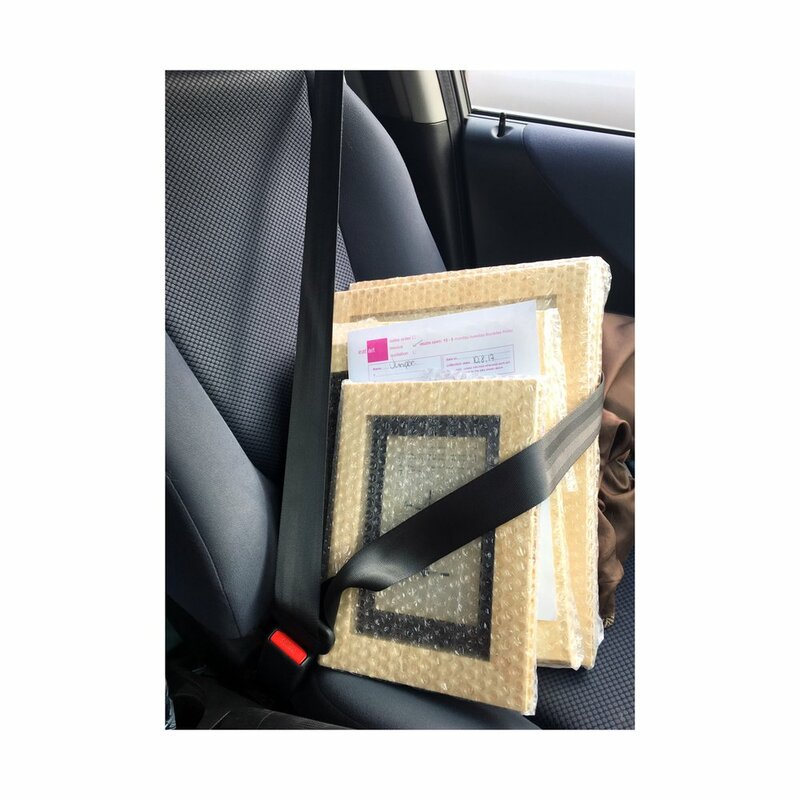 They’ve now off, with their precious cargo safely stowed inside, to some pretty important meetings. Here’s hoping they get the job done! It’s been an eventful week, my poetry book design for Guillemot Press and Amy McCauley’s exquisite words is tantalising close to completion (I bound a mock up – & I can’t wait for it to be sent to the printers!) I also had another excellent day teaching on the Fashion BA – these students have really impressed me and then to top it all off I’ve started to make my largest book ever, and so the battle of ruler and guillotine began! Earlier in the year I had the pleasure of hosting a residency for the Artist A.Goodwin. Her current Phd research had culminated in an extraordinarily beautiful archive of work, creating huge intricately folded pages which now need storage . I’m binding a flat copy of the work into a book (the dimensions of which are somewhat challenging for my studio) and boxes for the folded original artwork. Sadly the arrival of my new studio friend, the guillotine, despite its absolute beast of a size is not going to be any help with the book and boxes as the dimensions are just too out of this world! Although, that said, it has helped in a way, as the pallet it arrived on in now forming part of my new extended work bench, necessary for the oversized work. but my first port of call for the book was to acquire a huge ruler and large clamps - the old fashioned guillotine!! Though it cannot help me with the current project the guillotine is my new pride and joy – and with the extra lime green paint I had to hand I couldn’t resist a little personalisation. It is an ‘Ideal’ and in great working order, it’s taken me a while choose – but with an 8cm cutting depth I was sufficiently seduced and finally ready to commit. Yesterday started merrily spring cleaning the studio & I decided that more fun than cleaning would be making further mess. I advanced my ‘cutting and sticking’ game by doing a bit of carpentry: making a ladder shelf to display some books in my window. I thoroughly enjoyed the process – and am thinking of adding bespoke carpentry to my list of services. I made the impulsive decision of lime green for the paint - I was close to leaving the wood in its natural state, but was seduced by spring blinking it’s way into high street, so florescent green/yellow it was! I’m sure I can re paint it at some point if it becomes too bright. But my instant reaction is to love it. It took three coats to get a luxurious finish, and I became impatient so started filling it with books even before it was dry – I’ll regret that later. But in the meantime expect lots of Instagram shelfies. Check out those right angles. I'm so proud. I've been invited to write and teach a series of workshops on the Fashion BA at Falmouth University to help the students work towards the final portfolios. I had my first session this week and we looked at different classic techniques and we'll go on to develop further skills in the upcoming sessions. A line from an Emily Dickenson Poem which seemed Oddly Apt. the next line being 'not alone we fly' and much hard work of lots of lovely friends has made this space possible - along with friends & family putting up with my whirlwind mind and 100-things-to-do-at-once technique. An especially big thanks to Jules who cleaned the windows and hung the work. Thrilled to be among the winners of this years SoB awards.